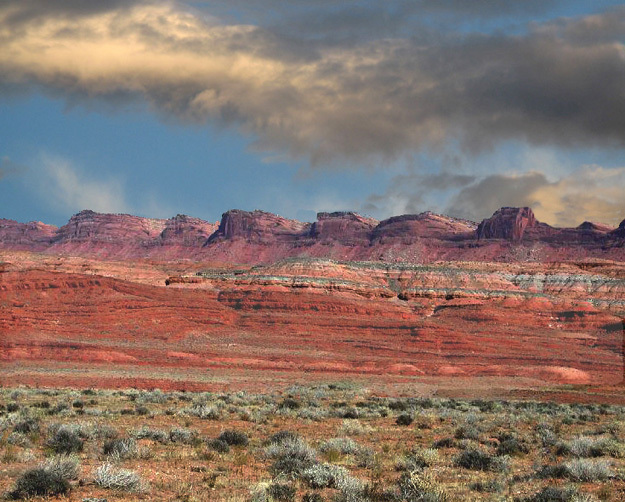 The earliest known inhabitants of the Cedar Mesa Plateau were Archaic hunter-gatherer cultures that roamed the southwest. These Archaic Cultures used open fire pits under natural shelters. 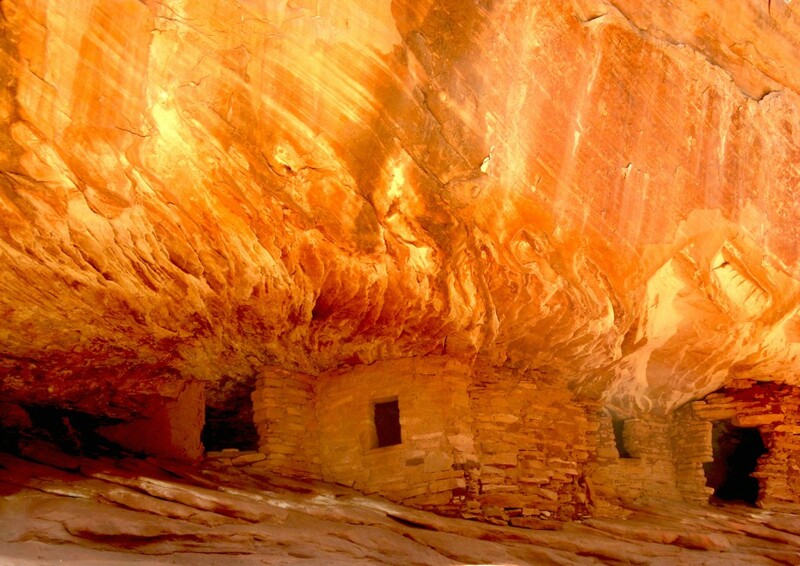 Recent research indicates Archaic Indians were moving through the Cedar Mesa-Grand Gulch area as early as 6500 B.C.. 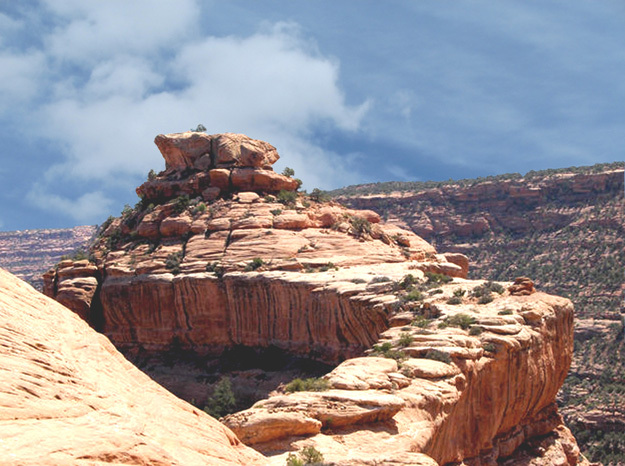 The Green Mask in Grand Gulch’s Sheik Canyon is attributed to the Archaic Period. A better example of Archaic rock art is Barrier Canyon (2000 B.C to 4000 B.C..) in the Maze District of Canyonlands National Park. From the Anasazi Basketmaker II period through the Pueblo period there was repeated occupation and abandonment of Cedar Mesa Plateau. 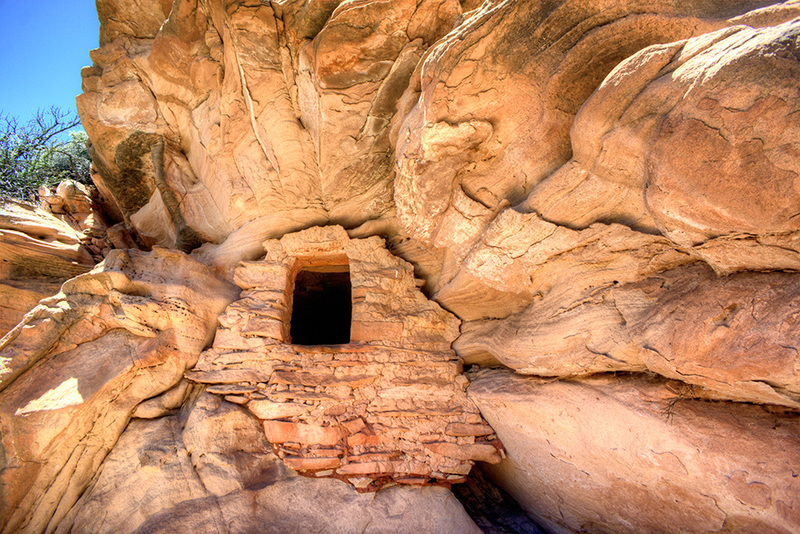 Archeology studies suggest the Cedar Mesa Plateau was abandoned between 400 to 650 A.D., and reoccupied between 650 to 725 A.D.. During this later period, evidence of pit structures and slab-lined dwellings are found in close proximity with villages of multiple dwellings in the rugged canyons of Cedar Mesa and Grand Gulch. 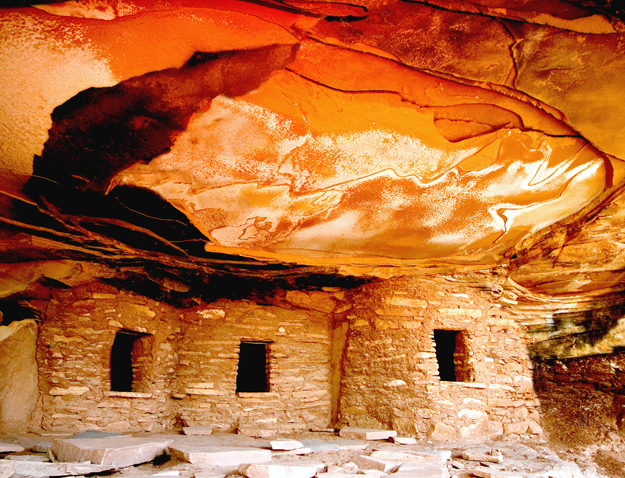 Cedar Mesa Plateau is home to one of the largest concentration of Anasazi ruins in the four corners areas of the southwest. 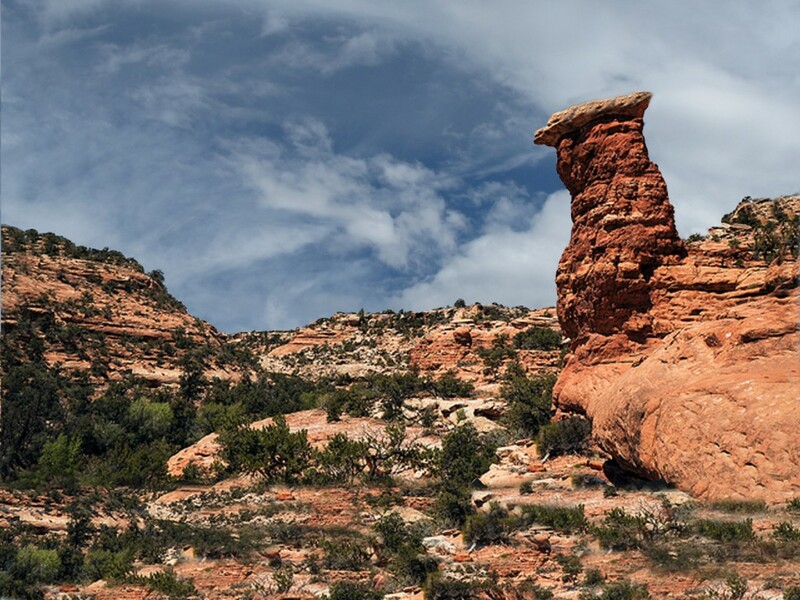 Located in southeastern Utah, the four hundred square mile (475,000 acres) Cedar Mesa Plateau is bounded by the Arch canyons on the north, Comb Wash on the east, Grand Gulch on the west, and the Valley of Gods and the San Juan River on the south. The only paved road on the Cedar Mesa Plateau is Utah State Hwy. 261 which runs north and south from Hwy 95 to Mexican Hat. 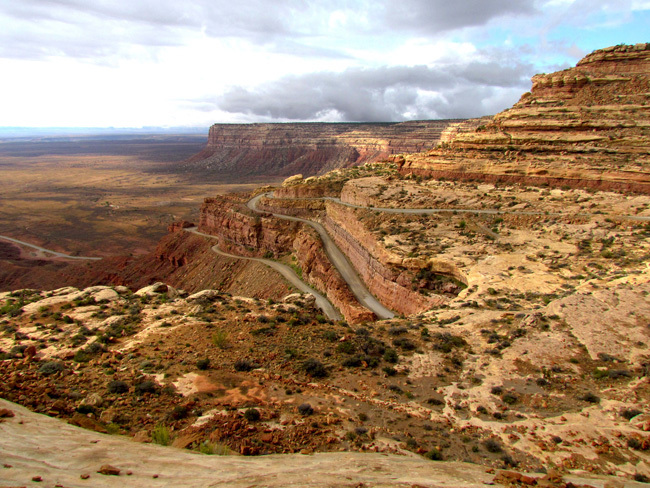 The narrow paved road drops eleven hundred feet in three miles as it goes from the Cedar Mesa Plateau down Moki Dugway into the Valley of the Gods. 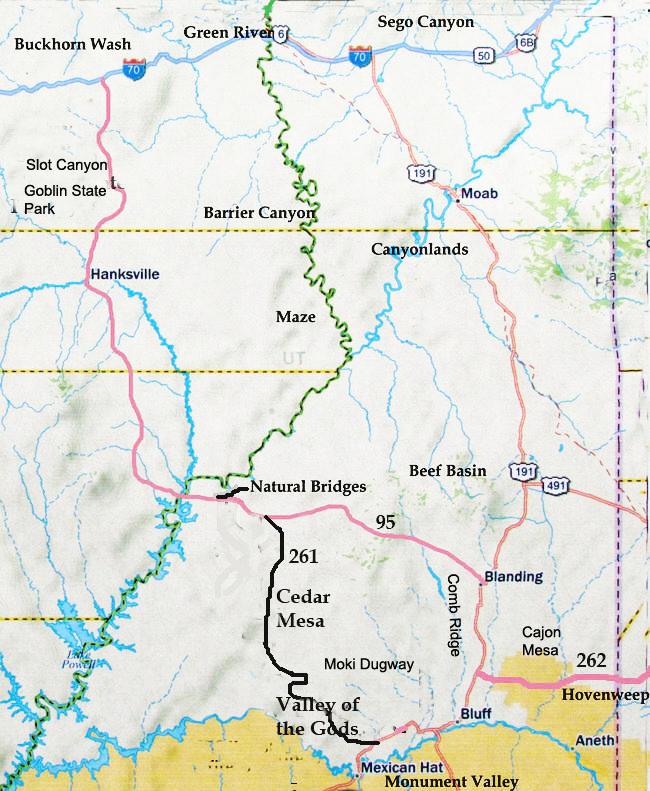 Utah State Highway 261 basically splits the Cedar Mesa-Grand Gulch area in half. To the east of SH 261, Fish Creek, Owl, Mule, Arch, and Road canyons drain into Comb Wash.
One of my pet peeves is people that want no one to know about these sites except a select group of friends. Sadly, this includes the BLM. Rough poorly maintained slick rock-dirt roads, few marked trailheads, and non-maintained cairned trails indicate the BLM has little interest, except to charge a fee, in making these sites available to the public. 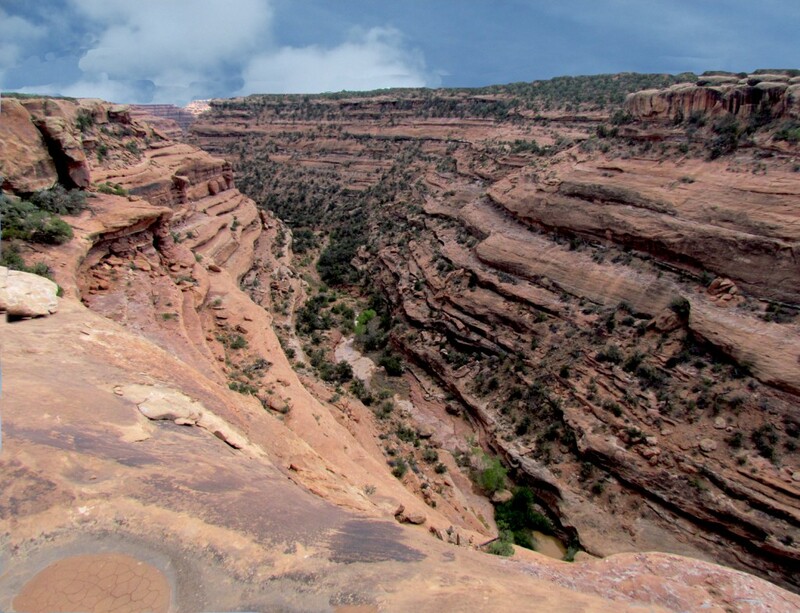 There are reports of rangers at Kane Wash being reluctant to provide directions to some sites…public lands should be open to everyone and the Cedar Mesa Plateau is on public land controlled by the Bureau of Land Management. This does not mean cutting off-road vehicle trails, taking artifacts, or damaging the ruins in any way should not be prosecuted to the full extent of the law. Policing the Cedar Mesa area is impossible. Restricting access is not the solution. 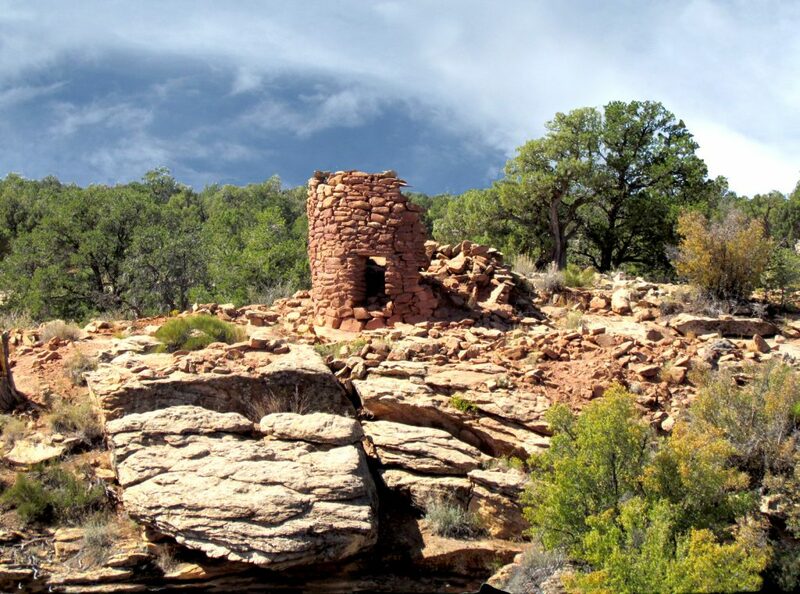 Many of the well known Cedar Mesa sites are hard to find and difficult to reach…internet comments suggest many visitors do not find the ruin they seek. 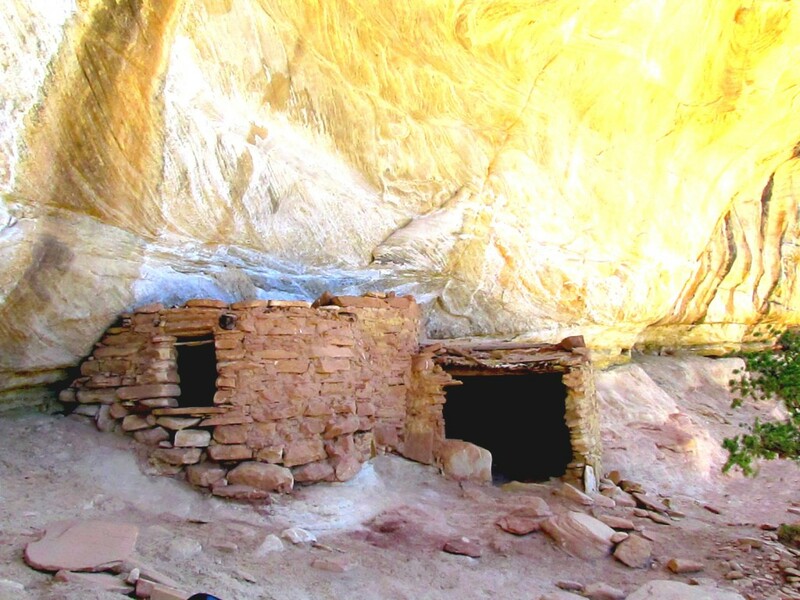 The vast majority of present day visitors to the spectacular canyon settings of the Cedar Mesa sites are acutely aware of the sites cultural and historical significance and the environment impact of visitors. Being naive, my belief is if people spend the time and money to experience these sites in a natural environment, they will be, and are, protective. I spent two weeks in September 2011, camped just off the Government Trail Road which is one of the major roads on Cedar Mesa Plateau. The Government Trail Road is not marked, but the road is directly across from Cigarette Springs Road, which is marked. There are three signed roads off of SH 261, Snow Flat Road, Bullet Canyon, and Cigarette Springs Road. Once on these rough rocky poorly-maintained roads, finding the trailhead to the ruin is the problem. Snow Flat Road (CR 237) is 6.1 miles from Kane Gulch Ranger Station. Snow Flat Road runs between McCloyd-Road Canyon and Owl Canyon. 8.2 miles down the Snow Flat Road is an unmarked parking area….N37° 24’ 51.1” W109° 47’ 43.7” For the most part, the Snow Flat Road follows the 1880 Mormon trail (Hole-in-the-Rock Trail) to Comb Wash. 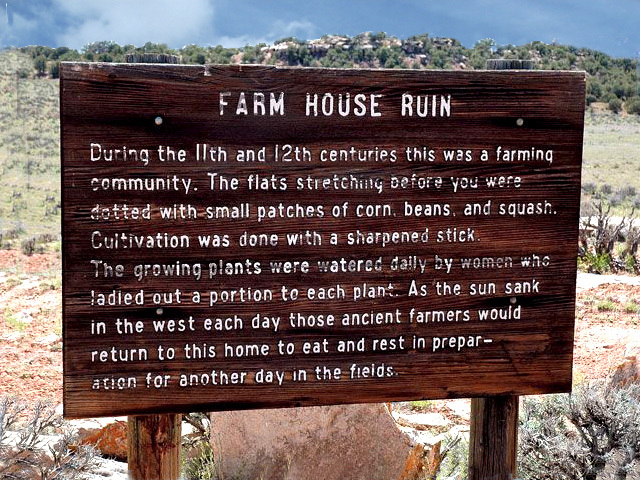 The Moon House ruins is one of the largest ruins on Cedar Mesa. The ruin showed two different periods of occupation. Cigarette Springs Road is 9.75 miles south of the Kane Gulch Ranger Station. After turning off of SH 261, the road goes between Road Canyon and Lime Canyon. From SH 261, it is about 3.75 miles to the trail head turnoff for the Fallen Roof Ruin…N37° 23’ 39.4” W109° 52’ 55.2”. At the end of the turnoff is some large fire pits, and a nice place to tent camp. In the trees to the right of the camp area is a Trail Sign. About two miles from the Road Canyon trailhead, the canyon widens with a shallow canyon coming in from the north. 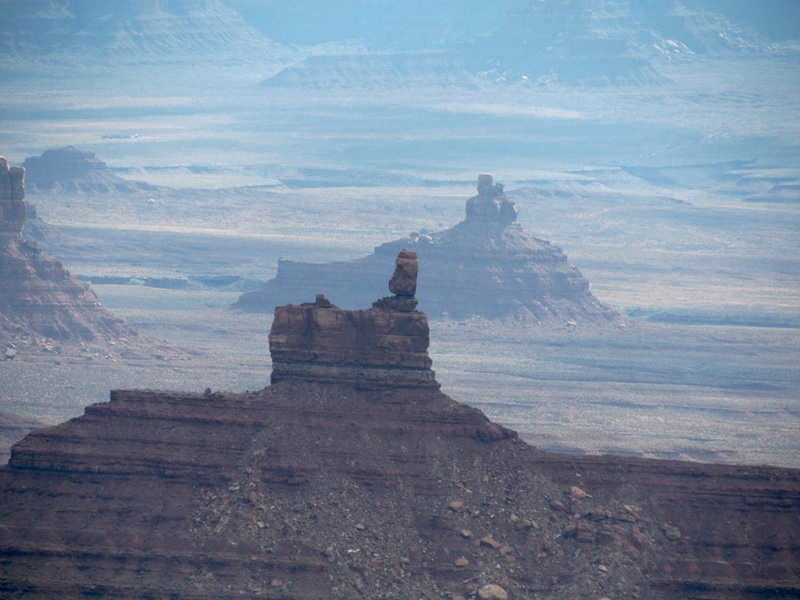 At this juncture is a large hoodoo with two huge boulders on the canyon rim above it. A few hundred yards down the canyon from the Hoodoo is the Fallen Roof ruin. The ruin is below the canyon rim facing south…basically all of the Cedar Mesa canyon ruins face south or east to take advantage of the warmth of the morning sun. The Seven Kiva site can be reached by continuing down Road Canyon, but it is easier to go back to Cigarette Springs Road. Another 2.5 miles down the Cigarette Springs Road is a road on the left to the Road Canyon rim…N37° 22′ 55.2″ W109° 50′ 37″. A cairned trail goes to the Seven Kiva Ruins. From this parking area, a cairned trail follows the Road Canyon rim east to the Citadel. Note: This looks as if water is running in the wash, but it is the rocks and sand streambed. There are two trails to The Citadel; follow the rim of Road Canyon or continue down the Cigarette Springs Road to where the road crosses a deep wash. There is room to park your vehicle by a large boulder on the left side of the road. Go down the wash a ways then leave the wash and go up on the ridge to the left. Watch for a cairned trail to the Citadel. Overlooking the Citadel, a cairned trail is about a hundred yards back on the Road Canyon side from which you can work your way around to the Citadel bridge. A pile of rocks in the center of the walkway appears to have been part of a defensive wall. 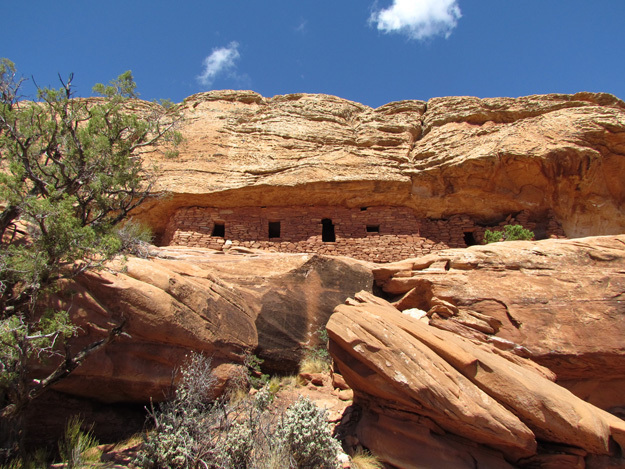 Visiting the Cedar Mesa-Grand Gulch ruins is a rare and special privilege….to the decedents of the Anasazi, these sites are sacred and should be treated as such. No one should touch, crawl in, or remove anything…take only a picture-leave only a footprint…and a deep respect for a culture long gone. Kane Wash, Todie, Sheik, Bullet, and Polly canyons drain into Grand Gulch then into the San Juan River. John and Slickhorn canyons drain directly into the San Juan River. All of the major canyons containing Anasazi (Ancestral Puebloans) ruins and rock art. A sign-marked Bullet Canyon Road is 7 miles from the Kane Gulch Ranger Station. From the Bullet Canyon trailhead, take the road to the right for 1.4 miles…N37° 27′ 3.4″ W109° 57′ 13.6″. The road to the left ends at the Sheik Canyon Trailhead. There is a cairned trail on the left side of the wash. The ruins are on the right side about a mile down the canyon. These fibrous ties are seven to nine hundred years old. 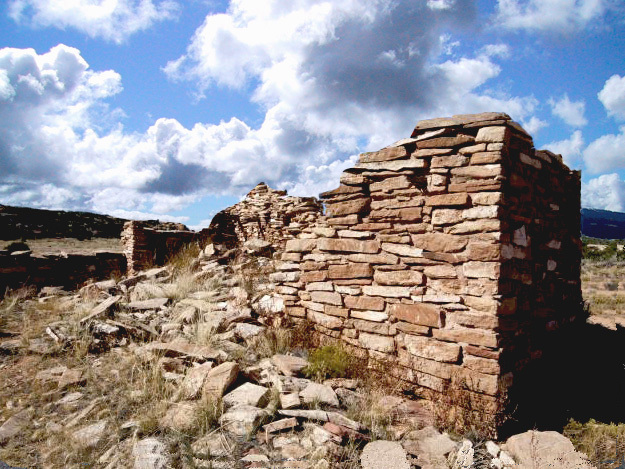 A day permit is required to visit the Cedar Mesa-Grand Gulch ruins. An additional special permit is required for the Moon House ruin. Permits are obtained from the Kane Gulch Ranger Station. The station is located on Hwy 261 about four miles south of Highway 95. 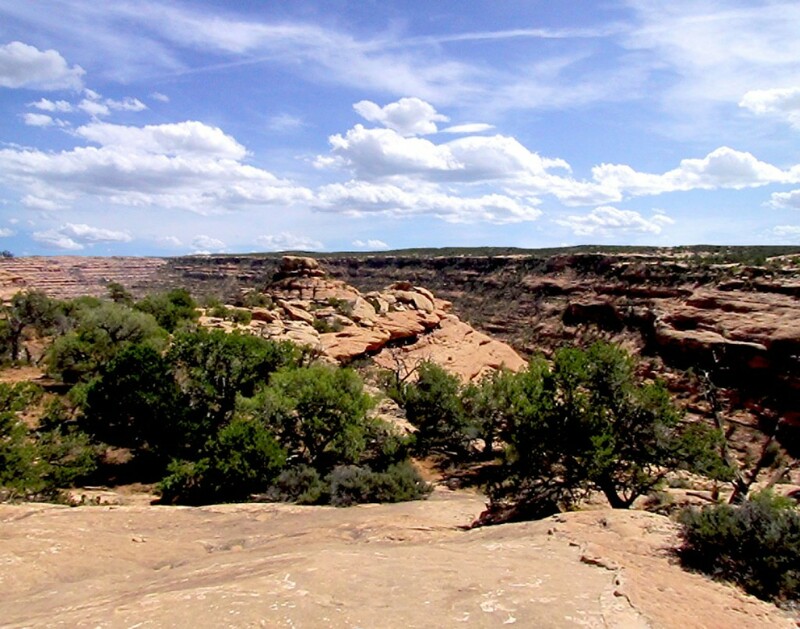 The Monticello Field Office of the Bureau of Land Management limits the number of group permits on Cedar Mesa and the Grand Gulch Primitive area from March 1 to November 30. Additionally, advance reservation are required from March 1 to June 15 and from September 15 to November 1. Nine miles east of the SH 261- Hy. 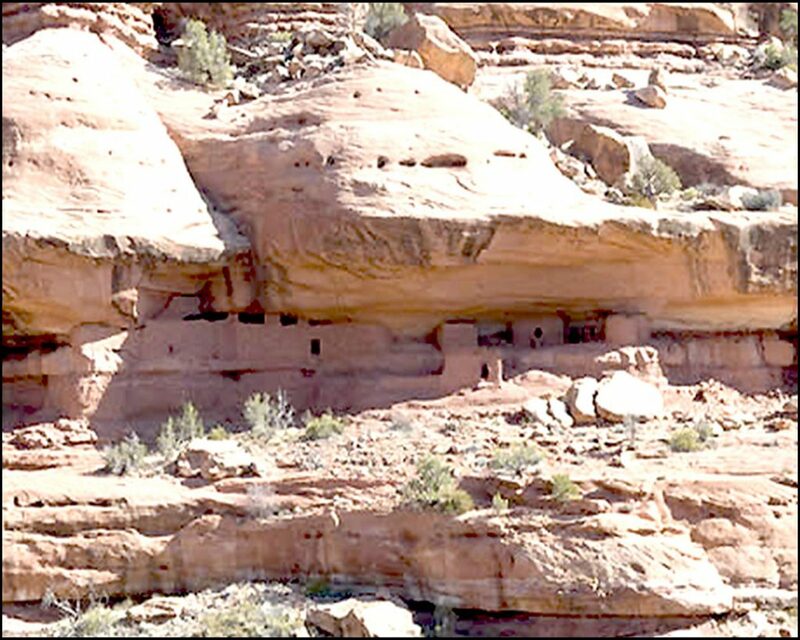 95 junction, the BLM has restored a Mule Canyon Anasazi village. Just east of the ruins turnoff (on left) is the road to the trailhead for the House of Fire Ruin. In little over a mile the road is wide enough to park along the side. Go down the wash on the left to reach the House of Flames. In May around 11:30 A.M. is the best time to get this dramatic effect. In the fall the colors were washed out. A little further east on Hy. 95 is a dirt road with a gate on the right for the Mule Canyon Tower Ruins. Above the Mule Canyon entrance into Comb Wash are several Anasazi Ruins. The cottonwood trees in the mouth of Mule Canyon provide an excellent camping area with a stream. Occasional springs and canyon wall seeps may have provide some water within the canyons of Cedar Mesa-Grand Gulch. 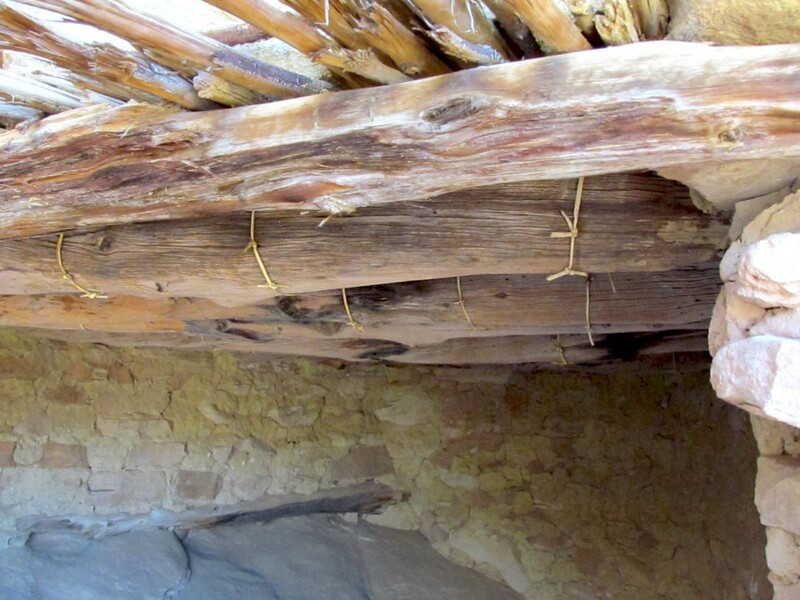 A midden (garbage refuge) at Turkey Pen ruins in Grand Gulch showed some turkey droppings contained corn…corn was originally obtained through trade with the Toltec from Mesoamerica. Several ruins, i.e. Road and Slickhorn canyon have sites with corn cobs, but these are the exception, not the rule. 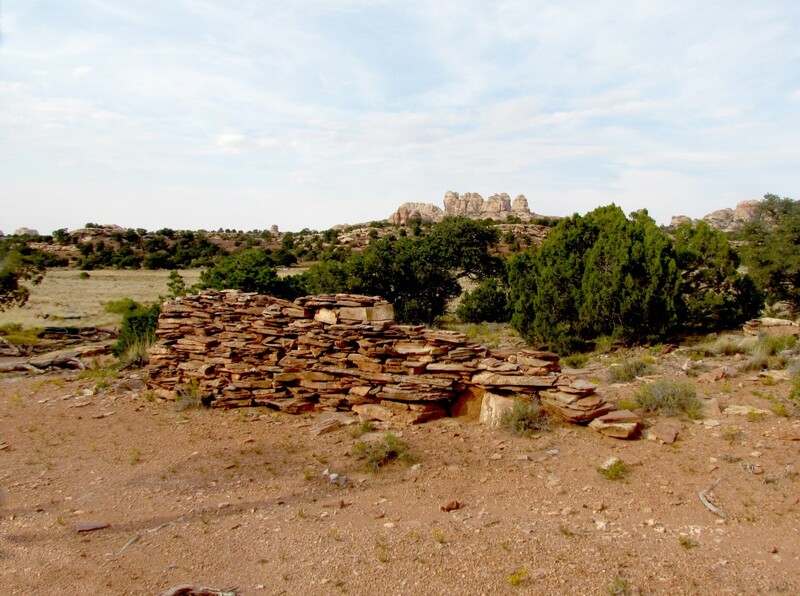 For the most part, the Anasazi of Cedar Mesa-Grand Gulch moved with the season gather pinyon nuts, cactus, and other edible plants to supplement a diet of lizards, bugs, mice, rabbits, squirrels, etc., along with an occasional deer or mountain sheep. 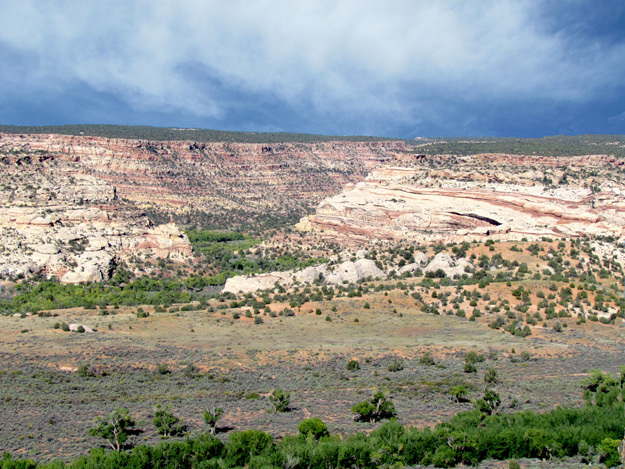 With water non-existent on the mesa top, except after a rain or snow storm, and the canyon floors subject to flash floods, it is more logical to suggest the Indians of the Cedar Mesa Plateau survived as hunter-gatherers, not farmers. 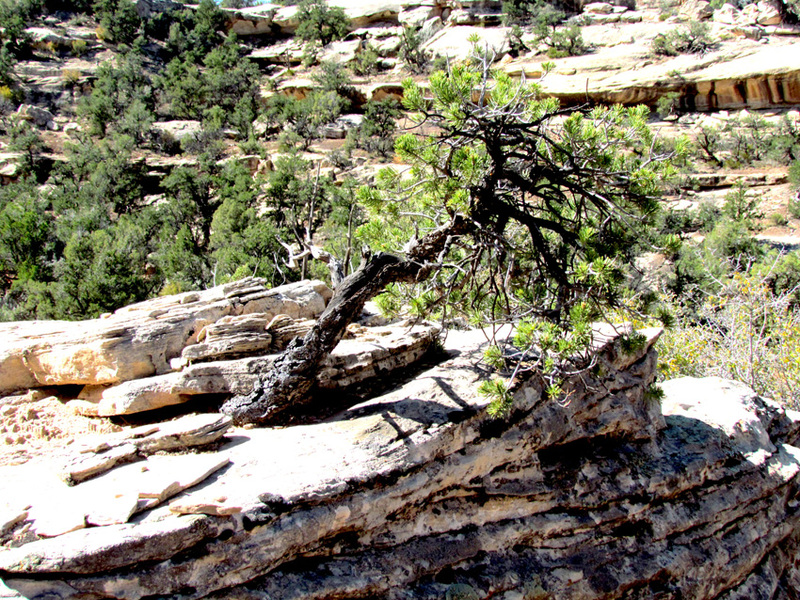 This pine tree in Sheik Canyon symbolizes just how hard it was for the Anasazi, the plants, or the animals to survive on the Cedar Mesa Plateau. 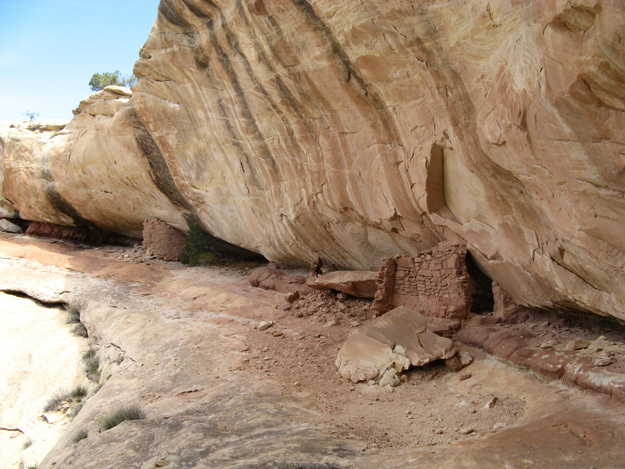 Archaeologists suggest the Cedar Mesa canyon ruins sheltered and protected the Anasazi as they farmed the surrounding mesa top. However, ruins under cliff overhangs high above the canyon floor suggest the dwellings were built as defensive structures more than as a farming community. Except small catch basins full of water after a rain or snow storm, lack of water on the mesa top would be severely limit farming…it rained for two days while I was there, and a few days later, the catch basins were dry. Beef Basin is between Cedar Mesa and the Needles district of Canyonlands National Park. 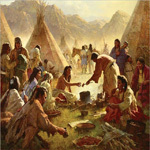 The possibility of the Cedar Mesa Anasazi trading for corn with the Anasazi of Beef Basin cannot be discounted. 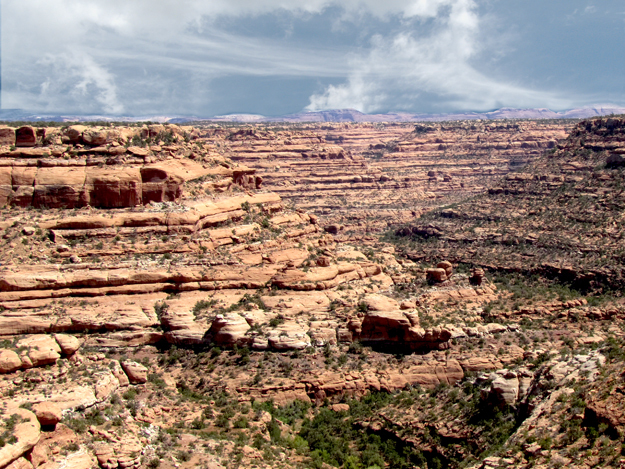 Beef Basin is northeast of the Cedar Mesa Plateau and south of Canyonlands National Park. 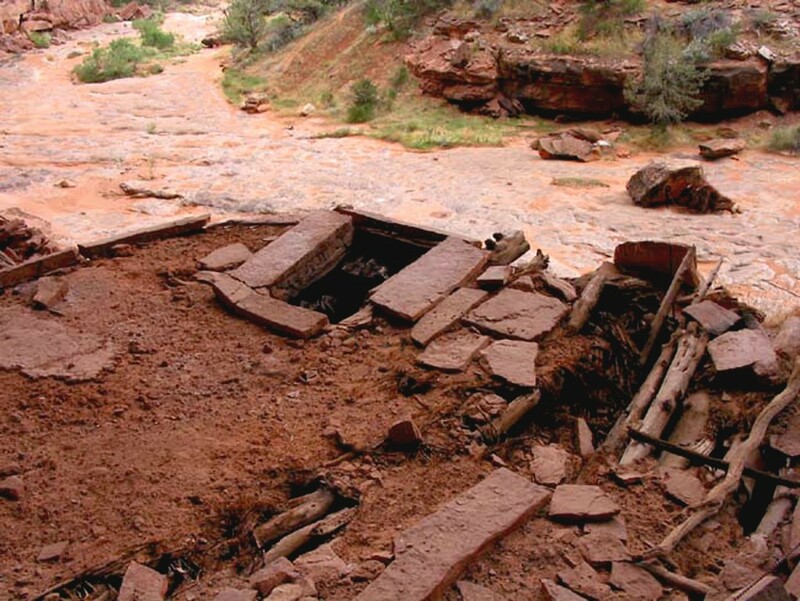 Located in the Abajo Mountains (Blue Mountains), Beef Basin contains many Anasazi Ruins. Water is the key to living in semi-arid areas, and from the deep canyon ruins pictured, getting enough water to drink would be a time consuming problem, let alone to irrigate crops. According to Craig Childs, House of Rain, lack of water, or too much water, is the leading causes of death in a semi-arid land…these deep twisting canyons were primarily cut by rushing water. 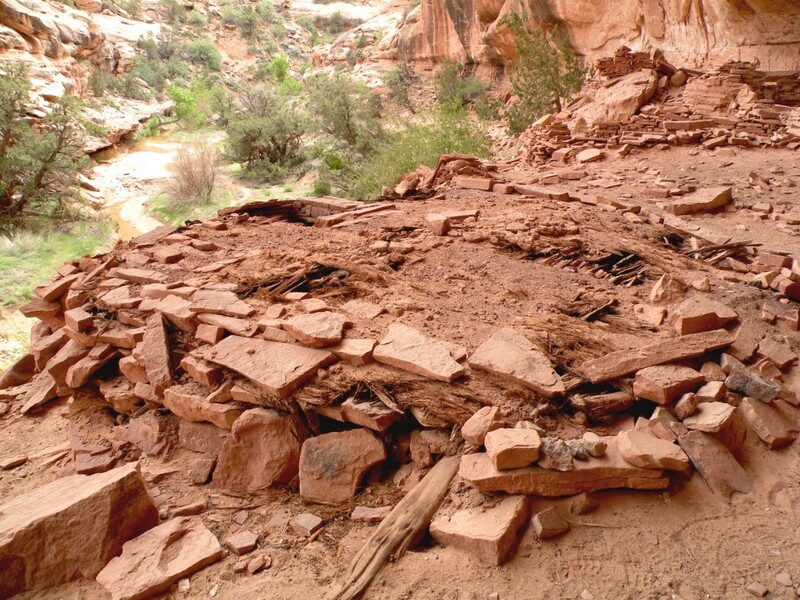 The Anasazi disappeared from the Cedar Mesa Plateau approximately seven hundred years ago, leaving archaeologists to speculate on the culture and departure of the Cedar Mesa-Grand Gulch Anasazi. The Cedar Mesa article was written by O. N. Eddins of Afton, Wyoming. Citation: Eddins, Ned. (article name) Thefurtrapper.com. Afton, Wyoming. 2011. This site is maintained through the sale of my historical novels. There are no banner adds, no pop up adds, or other advertising, except my books — To keep the site this way, your support is appreciated. There have been many requests for copies of pictures from the website. The best website pictures, and others from Jackson Hole, Yellowstone, Star Valley, Wyoming, and southeastern Utah, have been put on a CD. The pictures make beautiful screensavers, or can be used as a slide show in Windows XP. When ordering Mountains of Stone, request the CD and I will send it free with the book. The pictures on the Winds of Change CD are different from those on the Mountains of Stone CD. To view a representative sample of the pictures click on the CD picture. To return to the American Indian sites click on the Indian Village.